What is the value you deliver? Is it dots on paper or is it the right information to the right people when they need it? They usually need it really fast. If it is just dots on paper most companies have the printers to do that, but the logistics is what they are hiring you for. The reprographers that find a way to communicate the value of time and get paid for it will see their profits increase. Seth Godin has an interesting blog post on the value of time. What do Blueprinters and Nurses Have in Common? Many in the industry are acutely aware of the market perception problem that reprographers have. Few know what a reprographer is. People in the construction industry refer to reprographers as “blueprinter” or more commonly “printers”. We are not the only industry with a brand problem. I sat next to an accomplished gentleman on a plane yesterday. He was a “nurse”. His career started in the army where he was a medic. He was jumping out of airplanes and providing medical support in the field. After his career in the army he had two choices; become a doctor, or a nurse. He chose to be a nurse. This gentleman was giving me interesting statistics about nurses. What they actually do for patients as compared to doctors. Their increasing salaries. The shortages of nurses. It sounded like a great opportunity, but they are having a hard time attracting males to the industry. I wet out on a limb and asked him if he had ever seen the movie “Meet the Parents” with Ben Stiller. He smiled and said “Yes. I knew the woman who wrote the screenplay." He told me some of the stories and punch lines in the movie were his stories. He did admit he never milked cats. He said it took his father ten years to be able to tell others his son was a nurse. This gentleman is involved in several industry associations and is working on their branding. He admitted that as long as society's perception is that you need to wear a white cap and skirt to be a nurse they are going to have a hard time attracting men to the profession. I suggested his previous title “medic”. It creates totally different perception. There are similarities in our industry. Brands are shortcuts to perceptions. What do you think of when someone says nurse? What do your customers think of when someone says “printer”? There have been several comments on my blog and outside the blog about the recent HP product launch. They point out the fact that that HP is just catching with Oce and Cannon. What is interesting is the race to have faster production color machines. I said in my previous post that the market was about to get more interesting. Hewlett Packard has just announced the availability of the Designjet T1100 and Designjet Z6100 printers. They claim that it is three times faster than existing designjets. If you read their literature carefully it is obvious they are starting to position their color printers to be competitive with monochrome printers. They say the printers come with "inks that include the HP Three-Black Ink set helps ensure a 0.1% line accuracy (1) and the ability to deliver sharp lines and accurate colors with true neutral grays." Every company would love to launch the next innovation that makes their competitors products obsolete. Digital printing made diazo obsolete. The Xerox 8836/8840/8845 started the trend and the Océ 9800 brought about the end to diazo. What will make monochrome digital printing obsolete? Most speculate that it will be production color. The on-going debate is whether it will be LED technology like the KIP Color 80 or an inkjet technology from HP or Cannon. I’m not sure who will make it or where it will come from, but based on recent market developments, I believe it is coming soon. Below is a video of a new inkjet technology from Memjet, an inkjet research and development company based in Sydney, Australia.Memjet has 3,500 patents and patent applications for their technology. Texyt is a blog that covered this development The author reports "unlike conventional inkjets, the printhead spans the full width of the paper and does not need to shuttle from side to side." Below is a video of the Memjet technology in action. This is printing at 60 pages per minute or 58 linear feet per minute. An Océ 9800 and KIP 8000 are rated 32 and 47 feet per minute respectively. The Memjet technology will print 1600 DPI color. Steve Hoffenberg of Lyra Research says this technology has a “price/performance ratio that is off the charts.” The printer shown is obviously a small format printer, but the company claims they have a wide format with wide inkjet heads that allow the paper to move laterally under the heads. 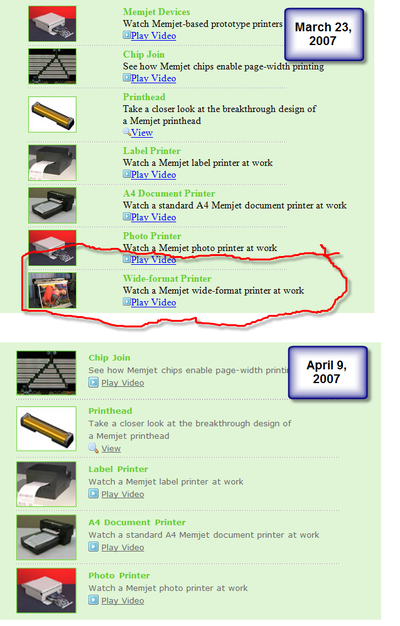 On March 23, the Memjet website had videos of this wide format device and by April 2 they were removed (see below). This is interesting to say the least. Memjet’s President of home and office business products, Bill McGlynn, is a former HP executive. HP has a competing technology called Edgeline (see the video). They claim this technology is scalable to wide-format, but the price point is substantially higher. Many believe this Memjet technology presents a substantial threat to HP’s dominance in the inkjet market. Memjet has made it clear that its intention is to license or sell this technology. The fact that the wide format video disappeared from the Website may be an indication that a transaction has been consummated. Hold on. It's about to get more interesting! In a previous post I discussed a reprographer that was confronted by an owner because of additional "digital services charges" on their invoices. Yesterday, the reprographer had the meeting with the owner. The owner had a stack of invoices on his desk and was prepared to take the reprographer to task. The reprographer had a frank discussion with him about the changes in the industry and the value of these additional "optional services" that are provided. By the end of the conversation the owner was on board and excited about the services being offered. He was even more excited about new digital services that were being offered by the reprographer. One of the most fascinating and ironic topics in the conversation was the owner's concern that the reprographer could survive. As the price of printing goes down and it is easier for companies to print themselves he thought "blueprinters" would become obsolete. At the end of the meeting he saw the value and wanted to make sure this reprographer could make money on the service he provided. He didn't want the reprographer to go away because he valued the service. Now this reprographer has a relationship with the owner, and an open invitation to bring him more ideas or present new digital services to help him complete construction projects on time and under budget. This tool can be used to calculate what a piece of equipment has cost you in the past, or to project what a piece of equipment will cost you in the future. Please click on the image below to access the tool. Market Value - What you paid for the equipment or for existing equipment what could you sell it for today. Salvage Value - At the end of the useful life how much can you sell the equipment for. Periodic Volume - How much volume per period (months or years) do you put on the equipment. * This tool is an approximation and does not take into account the time value of money. Many reprographers are good at calculating their unit cost. Those who have a good handle on their unit cost can determine how to best price their products to maximize their profit, but my observation is that not enough attention is paid to the unit cost of equipment. By the "unit cost of equipment" I mean the cost of the asset versus the cost to operate the asset. It is fairly easy to calculate the unit cost of paper, toner and service, but calculating the cost of equipment is a little different. Many people will say the cost of equipment is zero because my equipment is fully depreciated. Depreciation is an accounting method to spread the expense of equipment over its useful life. It is an approximation! Most accountants will use a straight line depreciation over 3 to 5 years, but the most accurate form of depreciation would be "activity depreciation". Instead of depreciating a certain amount every year or month you depreciate it for every unit produced on the equipment (based on the expected life of the equipment in units). In the case of reprographics it would be a depreciation per unit printed (square foot or square meters). This method can be complicated to administer so most accountants use straight line depreciation. It is important to recognize that depreciation can cloud what your actual unit cost is. Depreciation methods aside, the simplest way to determine your unit cost is with this simple formula. 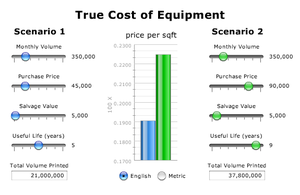 Purchase Price - What you pay for the equipment, or for existing equipment what is the market value. This formula will give you an estimate on a unit (sqft or sqm) basis what the cost of the equipment is. Below is an example. If you want to try this yourself or compare two scenarios the following post contains an on-line tool to do some "what if" scenarios of your own.